The kitchen is tough. It’s one of the last bastions in civilized culture that sets out to crush the spirit. Charlie, the client’s English Bulldog, in his favorite spot by the stove top. Photo by Sara Yoder and quote by Yotam Ottolenghi. 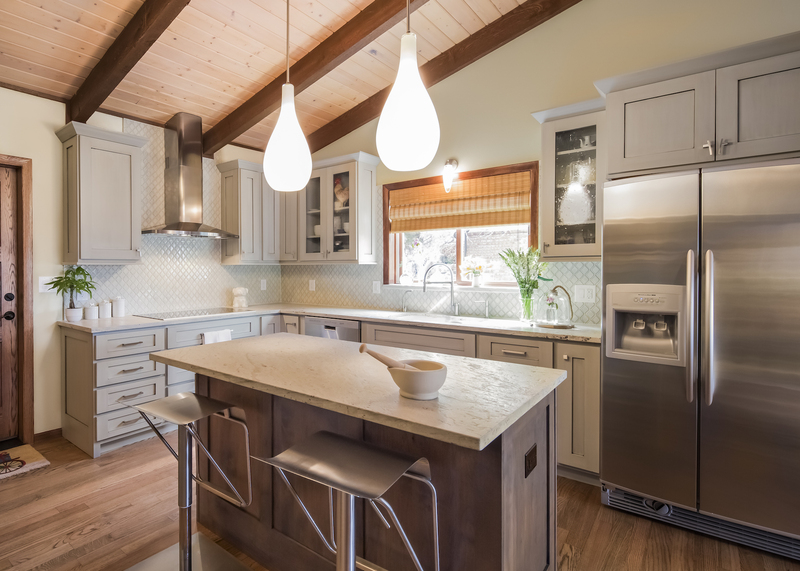 This kitchen, in the foothills of Golden, Colorado, is a renovation of an existing kitchen that had been updated last in the 1990’s. Fortunately, the previous cabinets were in good shape and we were able sell the existing cabinets using a local company called GreenCycling Homes. If you have a tight budget, try looking here or at a similar company in your area that re-sells cabinets. It’s a great way to get some quality cabinets at a budget price. Alternately, don’t just dump your cabinets in the landfill – sell or donate them! After photo: with a glimpse into the Laundry Room with a new layout, new cabinetry and a new glass door. 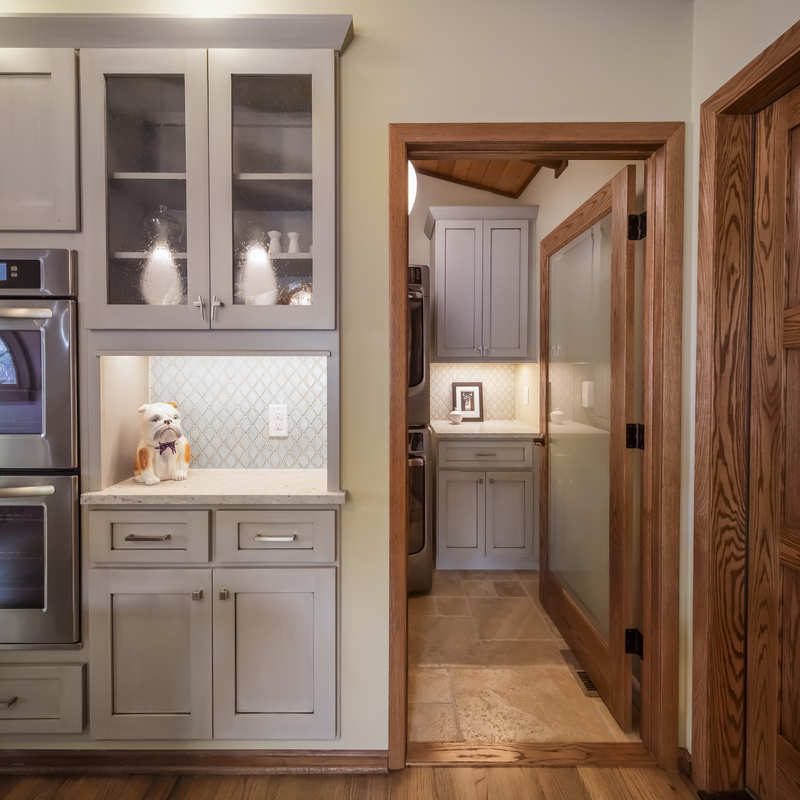 You can see that the cabinets were placed inside the laundry room, rather than use up precious floor space in the already crowded kitchen. Photo by Sara Yoder. After Photo with another view of the new steam ovens and countertop area and a view into the Living Room. Photo by Sara Yoder. Before Photo taken from the dining room of the home. Moving the microwave and oven created much needed counter space next to the stove and next to the garage door. 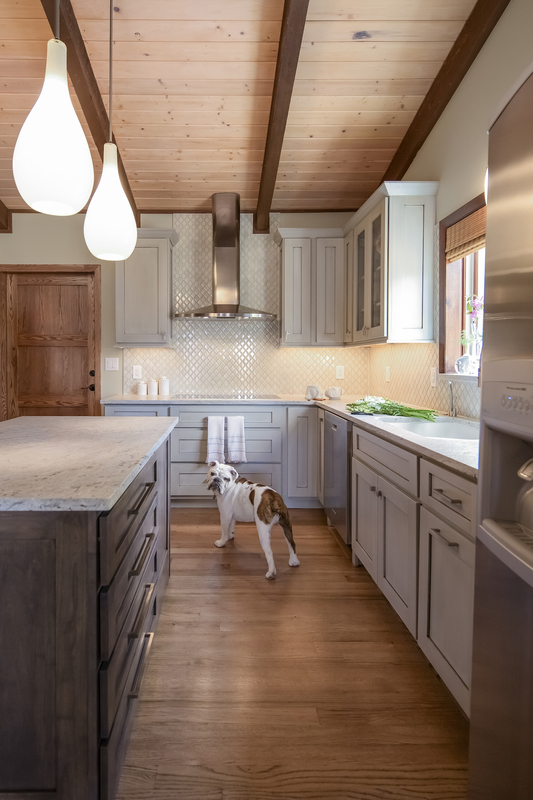 We enlarged the island as much as possible and created a new cabinetry layout for it that made more sense with the way the client uses this kitchen. We whitewashed the pine planked ceiling to tone the yellow down, but keep the wood grain and added a new, paneled door to the Garage. After Photo of the new Induction Cooktop with white leathered granite counters and Moroccan tile backsplash. Photo by Sara Yoder. The client likes a mix of contemporary style and function with old world charm. The home’s existing interior finishes, with soaring wood ceilings and wood floors, were kept in mind when selecting the cabinet finishes. 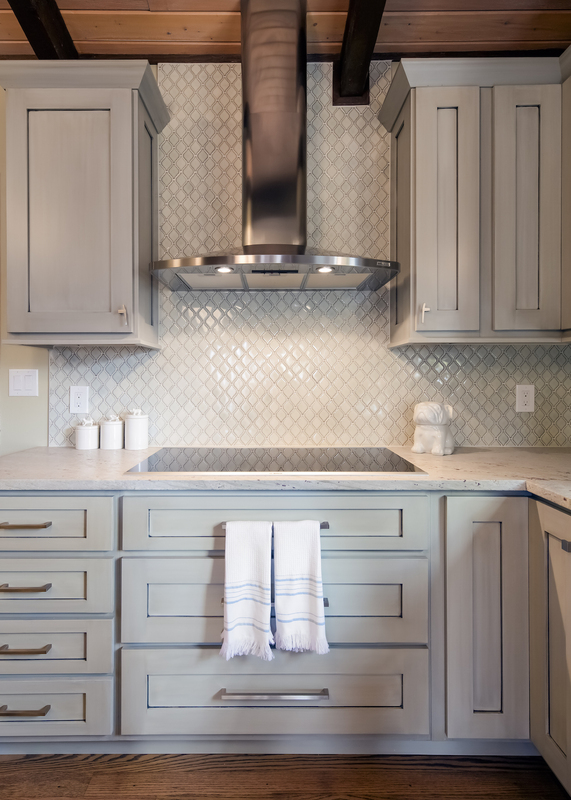 The client does not like things overly “mountainy” – so we used custom color, painted and glazed cabinets along the perimeter with an island a darker color stain over Alder. 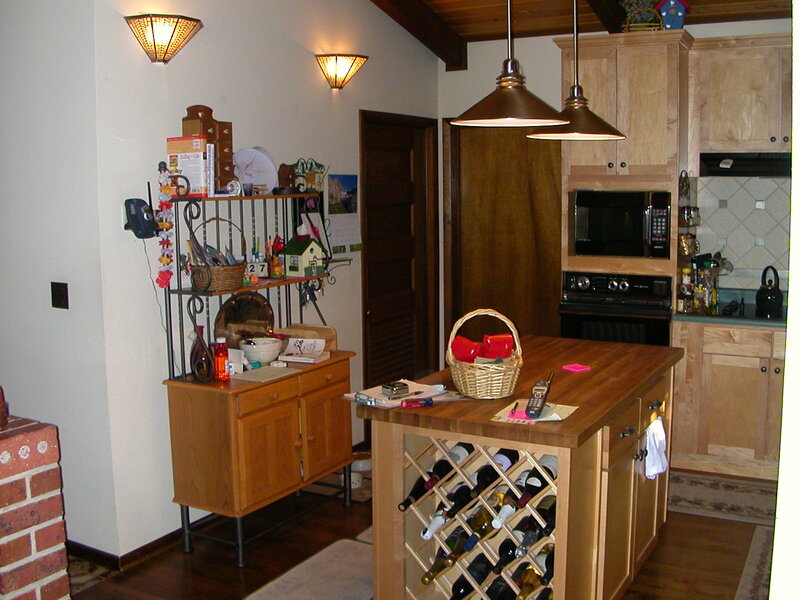 The painted cabinetry go well with the other wood finishes. 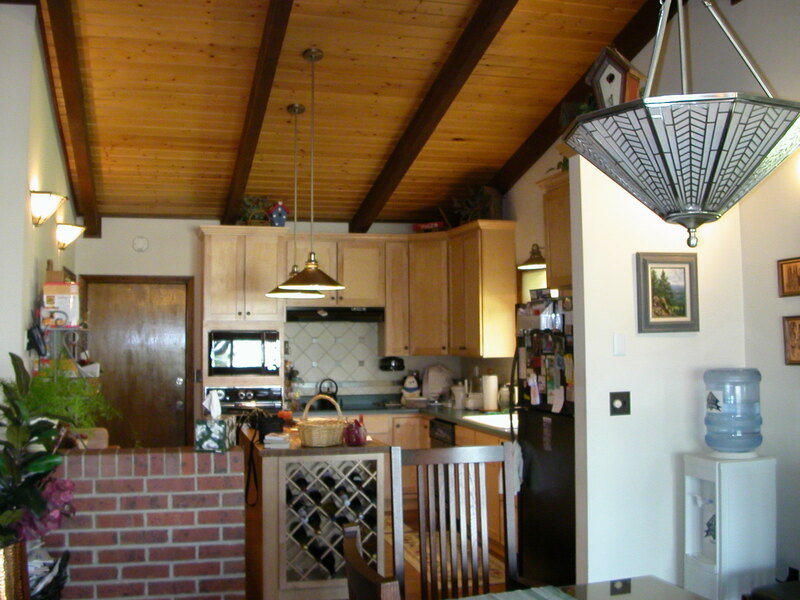 After Photo: the white washed ceiling and the new, white leathered granite countertops really brighten up the kitchen. Photo by Sara Yoder. The bones of this 1970’s rancher are quite excellent – it’s always fun to work on a project with existing architectural elements. 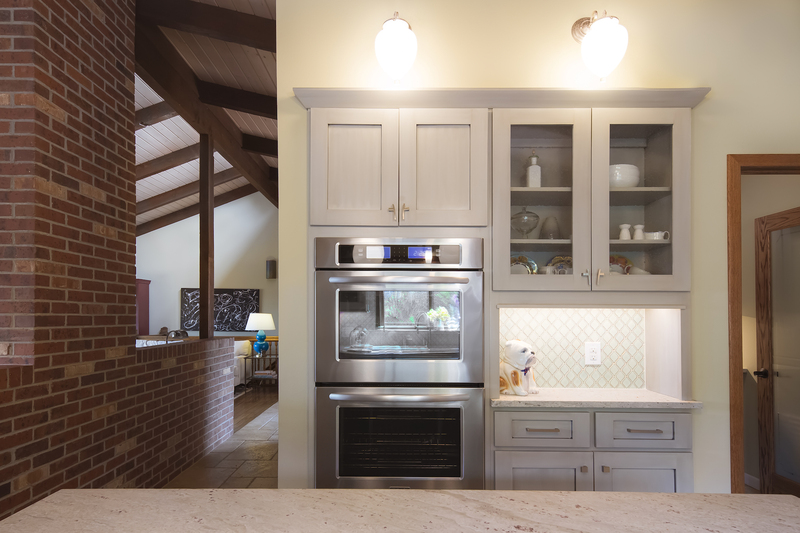 The mood change in this kitchen renovation is exciting and palpable – it transformed the entire feel of the space.